FIREFLY has been blowing things up for Cobra since COBRA COMMANDER first donned his hood and opened up for business. 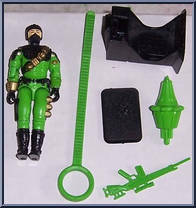 Since that time, Cobra has expanded to include entire battalions of bomb-planters, arsonists, and booby-trappers, but Cobra Commander still keeps contacting Firefly, the "Rembrandt of plastic explosives," when a job needs precision bombing. Firefly constructs bombs protected by cross-wired, anti-tampering switches so complex that they are impossible to defuse. No building, or mission, is too tough for Firefly. Contribute pictures, update details or suggest corrections for Firefly. Write a review about Firefly.